Item # 309723 Stash Points: 1,595 (?) This is the number of points you get in The Zumiez Stash for purchasing this item. Stash points are redeemable for exclusive rewards only available to Zumiez Stash members. To redeem your points check out the rewards catalog on thestash.zumiez.com. You may not be a bonafide herb enthusiast but that doesn't mean your style can't be on streetwear point! HUF presents their latest rendition of their signature Plantlife Crew Socks in an all-new loden camo composition. Featured with a tri-toned camouflage design and highlighted with contrasting orange weed leaf graphics, these socks are a complete head turner. 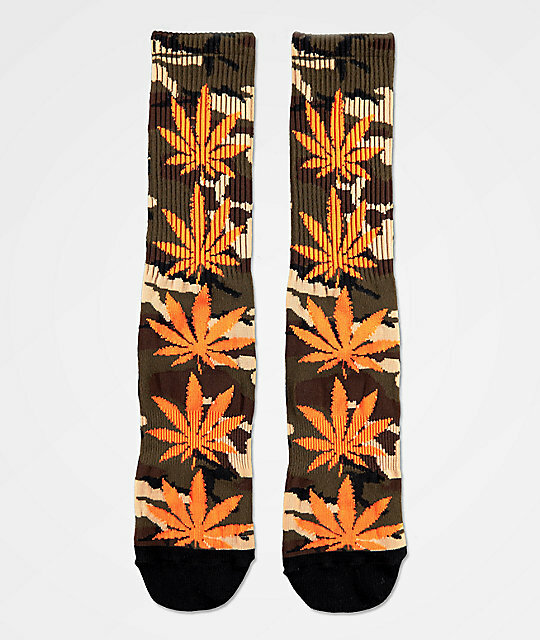 Plantlife Loden Camo Crew Socks from HUF. Green, brown and tan camouflage design throughout. Crew length with an athletic ribbed upper. Jacquard knit orange weed leaf pattern throughout.